Hello Amanda, thank you for taking part in an author interview with Sarah Jane of Rukia Publishing. If you enjoy this interview be sure to comment on one of our Facebook pages or on Sarah Jane's blog where the links will be posted. Don't forget to check out Sarah Jane's blog for details of a chance to WIN one of 5 copies of Amanda's book !!! Welcome Amanda and thanks for chatting with me today. Would you like to tell our readers a little bit about yourself? About me, well, I got hooked on writing when I did a two year course on Creative Writing at Sussex University. I’ve had quite a number of short stories published and have an MA in Creative Writing and Authorship from Sussex University. The Eloquence of Desire was my first novel and was published in 2010. This was a romance and won an award from the Royal Literary Fund. It has been translated into Turkish. My latest novel Just Two Weeks is a psychological thriller set in Sri Lanka and The Lakes in northern UK. This won the IPR Agents Pick. I love cats and singing and am an Alto. I sing in Dawn Chorus in Brighton where I live with my husband. I mentor new novel writers. I love all animals but especially cats. I chose ‘The Goldfinch’ because a lot of my friends were reading it. The title ‘We are all Completely Beside Ourselves’ intrigued me. I have always written poetry but I started writing a lot of short stories in 2002. I then progressed to my first novel, The Eloquence of Desire. Do you have an formal writing training? I have an MA in Creative Writing and Authorship from Sussex University. I write psychological thrillers, but my first published novel, ‘The Eloquence of Desire’ was a historical romance. Is there an author you'd love to be compared to? Ian McEwan who I met many years ago at one of his signings encouraged me to keep on writing. I prefer to write in the morning when my mind is fresh. My own room, desk, computer, chair with a view of gardens and our cat Molly snoring away on another chair. I would like a whiteboard to jot down ideas and to be surrounded by my books. I have all of the above except the whiteboard and ‘my room’ is half of the lounge. 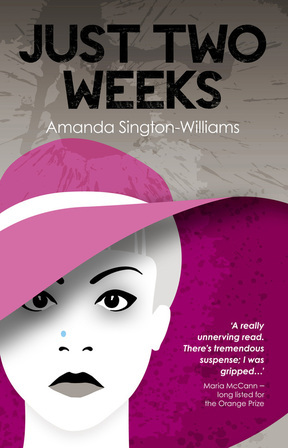 I would love my latest novel ‘Just Two Weeks’ to be read and enjoyed by as many people as possible. I would also like to be ‘found’ by a big name publisher! This is a review for ‘Just Two Weeks’ my latest psychological thriller which I selected because it was the first 5 star review my novel got. "After being laid off, Jolene Carr decides to make lemonade from lemons and takes a two week vacation in the sun. On the first day of her break, she meets Raquel, a woman staying at the same hotel and they strike up a casual friendship. Not long after, Jolene begins to experience odd and unsettling events. Back at home she becomes convinced that Raquel has followed and is now stalking her. But why? Did Jolene do something to invite this behaviour? How much will she be able to withstand? A frightening novel about the terror of being stalked. Keep reading – there are some surprises in store. A jolly good read." Reviews are very important as they show people have read the novel. Good reviews encourage other readers to buy the book. It is always useful to know what readers like. How long did it take you to write Just Two Weeks? ﻿Anyone who likes psychological thrillers, but because of the main character, particularly women. What are 3 of your favourite lines/quotes from Just Two Weeks? ‘He nodded to the back of the café, picked up the bill, handed it to her. ‘You've got one here? But I thought –’ She grabbed her bag and rushed to where he pointed. Her stomach was knotting and she felt sick. Outside the toilet there was a sink with a bent tap, a cracked mirror. She knocked on the door marked WC, went in. ‘Christ!’ she said while she stood in the concrete room with the cracked toilet bowl and the sound of jet skis buzzing through her brain. She reached into her bag and pulled out her towel. There was nothing else. No purse. No passport. Her book dropped to the floor: A Memory of Loss splayed in the dirt. She searched in her bag again, turning it inside out, shaking it violently. Nothing. Someone began banging on the door. From Chapter 9: ‘They said nothing, but continued removing her belongings from the case. She was trembling all over as she held a hand to her throat. Very soon, the case was empty. But no. There was more. What were they doing? She stared, feeling sick. A false bottom that she knew nothing of, that Mark hadn’t told her about. Do you have a current work in progress, and if so when is it likely to be released? I am planning another psychological thriller with a working title of “The Longest Hour’. I am aiming at 2016 for a release. What are your thoughts on authors marketing methods and what do you find to be the most successful for your genre? I think giveaways are a good idea. Also book blog tours and Twitter gets your book out there. Just Two Weeks will be on Netgalley until 28th November by which time it will have been there one month. To date there have been 60 downloads so hopefully some reviews will come out of that. Guest blogs are good too. Do you have a blog? Where can we read it? Thank you Amanda for taking part, it has been lovely to get ot know you and wyour work in more detail. We wish you every success wiht Just Two Weeks and look forward to reading more from you in the future.